APPEARANCE: Kasane is the ghost from Kasane ga fuchi—The Pool of Kasane. It is based on true events which happened in the 17th century in what is now Ibaraki Prefecture, although the story has changed quite a bit from the original incident. Her tale is one of the most famous Edo period ghost stories, and she is often held up with Oiwa and Okiku as a prime example of the grudge-bearing Japanese woman ghost. Her story was later adapted into rakugo and kabuki theater, as well as numerous films. LEGENDS: Long ago in the village of Hanyū in Shimosa Provence lived a farmer named Yoemon and his wife Osugi. Osugi had a child from a previous relationship. The child’s name was Suke, and he was terribly ugly. His face was disfigured and his leg was malformed. Yoemon hated Suke. One day, Yoemon decided to dispose of Suke. While crossing a bridge over a deep pool, Yoemon knocked Suki into the pool. Suke was unable to swim, and drowned. The following year, Yoemon and Osugi had a baby girl. They named her Rui. Rui looked so much like her half-brother Suke did that the villagers all believed she was haunted by his spirit. Instead of Rui, they referred to her as Kasane—an alternate reading of her name which implied that the ugly Suke had been born once again in her. Both of Kasane’s parents died while she was young, and so she lived alone. She became very sick, when a wandering stranger named Yagorō came to her house and nursed her back to health. Out of gratitude, Kasane offered to marry Yagorō and make him the inheritor of her father’s property. Although Yagorō found Kasane repulsive, he wanted her land and inheritance, and so he agreed to marry her. Not long after they were married, Yagorō had had enough of Kasane’s ugliness. He took her out to their fields to collect beans. On the way home made Kasane carry all of the beans herself, so that she could barely walk. Just as they were crossing the pool, Yagorō pushed the overburdened Kasane into the water. Yagorō jumped in after her. He stepped on her chest, pinning her to the riverbed. He crushed and squeezed the air out of her lungs. He shoved rocks and river sand into her mouth. He stabbed her eyes with his thumbs. Then he wrung her neck until she could struggle no longer. Several townspeople witnessed Yagorō murder Kasane, but nobody moved to help her. After all, she was so ugly—there seemed to be an unspoken agreement to just leave it be. Yagorō continued on as if nothing was different, living in Kasane’s home and maintaining her family’s lands. He remarried very quickly, and for a while was happy. However, Yagorō’s new wife died suddenly, not long after they were married. Yagorō remarried again, and again his wife died suddenly. This happened over and over again. When Yagorō had remarried six times, his wife managed to survive long enough to bear him a daughter. They named their daughter Kiku, and for a while they were happy. Kingorō fled the village, never to return. Kiku’s body stood up and lunged at Yagorō, but he managed to escape to the village temple. Yagorō told everyone that he had no idea what Kiku was saying; that he would never murder his own wife. The villagers, wanting to save poor Kiku, dragged Yagorō out from the temple to confront Kasane. Even as Kasane’s spirit threatened and cursed Yagorō, he defiantly proclaimed his innocence. Kasane’s spirit began naming and cursing the villagers who witnessed her murder and yet did nothing. Finally Yagorō and the others confessed their crime. Rui was such an unattractive and unpleasant person that the whole village had neglected her. 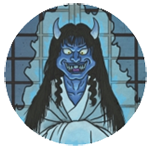 Though Yagorō had performed the deed, the whole village was guilty of her murder. The villagers who didn’t witness the murder, but never bothered to ask about Rui were partially responsible too. 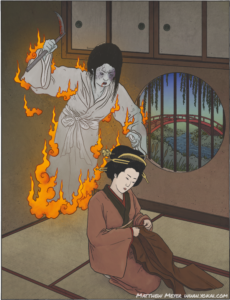 It was their fault that Rui’s rage had created this ghost, and it was their fault that poor Kiku was suffering. Kasane continued: “All of your ancestors are here with me in Hell!” She then proceeded to name each of their ancestors, and list their crimes. Then Kasane listed all of the crimes of the living villagers. The entire village’s pride was shattered as their sins were made public. Kasane demanded that the villagers hold a lavish memorial service and erect a beautiful stone buddha in her honor to end her suffering. However, the villagers balked at the cost to cover such a funeral. Kasane told them, “My father owned many farms around here. Sell them, and use the money to perform the services!” The villagers confessed to Kasane that her family’s lands had already been sold and distributed. Kasane’s wrath exploded. Kiku’s body twisted and floated high up into the air, and the poor girl lost consciousness. Word of Kiku’s possession and Kasane’s curse spread far and wide. It caught the ear of a traveling priest, Saint Yūten. Yūten visited the Yoemon household to offer his prayers and try to save Kiku. He chanted the sutras and prayed and prayed with all his effort, but it had no effect. Kasane’s grudge was too powerful. Kasane’s voice taunted Yūten from Kiku’s mouth. Yūten then tried to have Kiku recite the prayers, but Kasane’s spirit interrupted and Kiku was unable to speak. Finally, Yūten grabbed Kiku’s hair with all his strength, forcing her face down onto the floor. He make Kiku bow, and demanded that she pray. Kiku was finally able to recite the sutra, and suddenly the spirit of Kasane left from her body. She was saved. “Are you Suke?” Saint Yūten asked Kiku. Kiku’s voice replied, “Yes. When you saved Rui you left me behind, and now I possess her.” Yūten wasted no item. He immediately gave Suke a kaimyō—a posthumous Buddhist name—and wrote it down on the family altar. Suke’s spirit left Kiku’s body and entered the altar. Everyone present dropped to the floor and prayed. Kiku eventually remarried, and lived a happy and prosperous life. The spirits of Kasane and Suke were never heard from again.